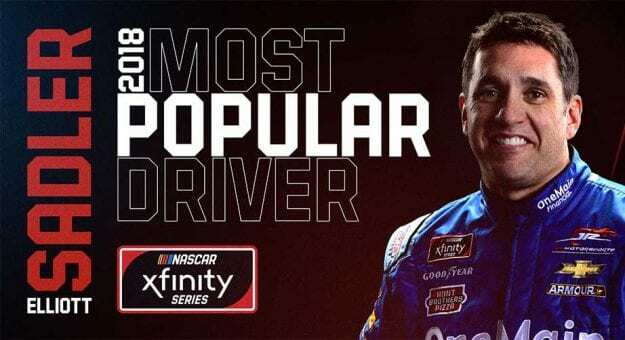 Elliott Sadler has been named the NASCAR Xfinity Series Most Popular Driver for the third consecutive year. Sadler retired from full-time NASCAR national series competition following the season finale at Homestead-Miami Speedway, ending a 23-year tenure that saw him compete in 853 races across the Monster Energy NASCAR Cup Series, Xfinity Series and Camping World Truck Series. The driver of the No. 1 JR Motorsports Chevrolet finished fifth in the final Xfinity Series standings after making it through to the Round of 8 in the Playoffs, concluding his last season with 14 top-five and 24 top-10 finishes. The award for Sadler, 43, continues a seven-year run for JR Motorsports drivers. Other former JRM drivers to earn the honor during that time include Chase Elliott (2014-15), Regan Smith (2013) and Danica Patrick (2012). The Virginia native also won the award in 2011. Sadler will be honored at the Xfinity Series Awards banquet on Dec. 8 in Charlotte.